Going Nutty! : "An Eval, a Christmas Wish and Pac-Man all walk into a bar..."
p.s...I showed my husband your shirt that you need to get - and his response? "That's just nutty!" hehehe! Congrats on the great eval!!!!! Also, thanks for the good laugh! I needed that. My day wasn't as quite as eventful as yours. Just the typical one child constantly falling out of the his chair...he has horrible gross motor skills. I really like the part where the child broke out into song while in the bathroom. I have two tile bathrooms and the acoustics are great in there! Also, when you turn on the loud fan...it acts as the base to any great hip hop song. I frequently hear several Black Eyed Peas songs being sung from our johns. You gotta love being a teacher of little ones. You never know what to expect! PS...the sweater is a MUST HAVE! I will let you know if I find where you can get one! I have a mission! I need to find you that sweater! That is awesome. hahaha!!! Love it! 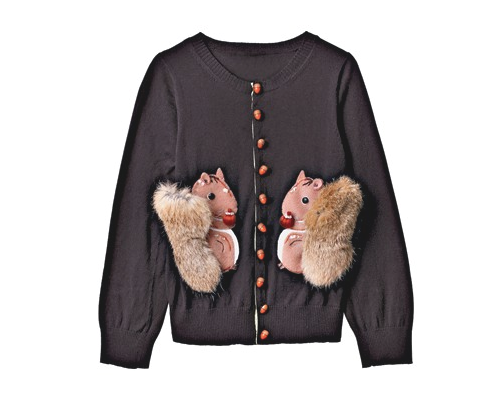 It's amazing how many squirrel sweaters there are out there (in Google land). You should see me. I'm googling and searching Pinterest like crazy! Lol. Hi Staci - I absolutely LOVE your blog! You crack me up!! Congrats on your good eval, although I'm not surprised that it went well =) In this post, you mentioned that many of your kids had to write reflection letters. What is this? I teach 1st as well and use Responsive Classroom for management, but there are definitely some days that the parents need to know how their child's day was. Do you have a form you use? Just wondering =) Thanks for all that you do!! That is a hoot and a half! Can I tell you I already tried the Pac Man thing. I'm such a nerd. It's like when someone says it's impossible to lick your elbow. Immediately you try to do it! Congrats on the EVAL! Awesome Teacher Friend!!! Proud of you for making it thru' the eval with flying colors! We are also a RTT district and our evals are coming too..a little nervous myself so I know your pain! Thanks for making me giggle tonight! Again congratulations! Hi! Thanks for stopping by my blog! I see you're a K-1 teacher, which I've taught a lot of as well. I'm currently in second grade and wondering if it might be my new favorite. Congrats on your glowing eval--I know those are not fun! I will post the letter that I use. In the beginning of the year it is kind of fill in the blank, later they write more of it, and then by Spring- they are on their own. It goes along with my behavior chart (In the I'm Thankful post)....I have to find a paper copy and scan.....my mac died last feb and i lost a ton of stuff (digitally),.... but I will get it on here! I read this post this morning with my eyes half open getting ready for work. I laughed so hard at the pac man thing that I was crying. LIke real tears crying. I thought it about it during the day and had to come back and see if it was just the ungodly hour that made it so funny...nope. Still cracking up! Sounds like you are a fellow Tennessee teacher! Glad you had great results on your eval. I just finished mine--one hour before we were out for Thanksgiving break. I so love your humor! Thanks for making my day a little brighter--and congratulations on your evaluation! Now...we are finished until next semester. And the pacman thing - tried it. Laughed. Laughed again. LOVE THIS POST! I am a bit late to the party as they say...I am reading through your blog from the beginning because I LOVE it! This post made me laugh so hard tears were streaming down my face. Thank you so much for your humorous outlook on life. I so enjoy your posts and am grateful for you. Your pink and green design with the little squirrel and acorn is the cutest ever!